ChargeIt by Jay Brick Brown Square Rattan Charger Plate 13"
Home > Products > ChargeIt by Jay Brick Brown Square Rattan Charger Plate 13"
Naturally enhance your food presentations with the ChargeIt by Jay Brick Brown Square Rattan Charger Plate 13". Boasting a rustic appearance, this charger plate is perfect for outdoor cafes, resorts, or themed catered events. Thanks to its attractive brick brown shade and intricate thick weave, this charger provides an excellent backdrop for bright white dinner plates and bowls. 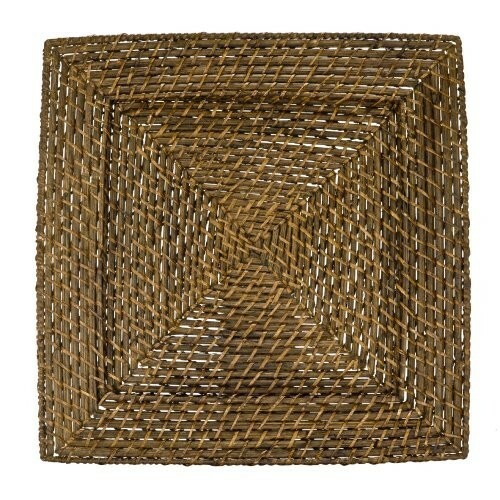 Made from high quality rattan, this charger plate is exceptionally tough and durable. To keep this charger plate in excellent condition for a long period, hand washing in warm water is highly recommended.